Not a day goes by that a teacher, principal, school, or district is not thinking about one standardized test or another, whether it be the Arkansas Benchmark, Iowa Test of Basic Skills (ITBS), or End of Course Exams (EOCs). However, the students are probably anxious about a completely different set of tests: AP exams, the ACT, or the SAT. As their K-12 career comes to an end, many students have the opportunity to take exams that can significantly impact the next stage of their lives, affecting what college admission letters they receive, what financial aid packages they are awarded, or what classes they are given credit for. 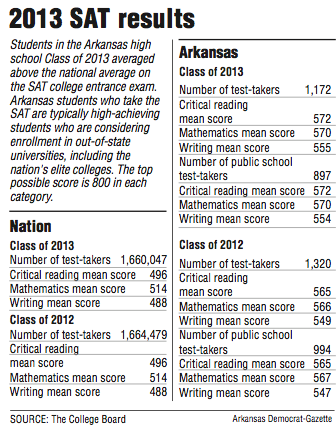 Arkansans should be encouraged by the aggregate results on AP Exams and the SAT (both College Board exams) that were released last Thursday. Of the 24,364 Arkansas students who took AP exams, 13,298 (55%) received “passing” scores of 3, 4, or 5, which allow a student to be exempt from the corresponding academic course at many colleges and universities. The state pays the $80 fee for students to take these tests, provides funding for teacher training for these courses, and gives incentives for those who do well. In addition, SAT scores increased for all three sections from a year before: 566 to 570 in Math, 565 to 572 in Reading, and 549 to 555 in Writing. While most students in Arkansas take the ACT for college entrance, the SAT scores are often obtained for admission to out-of-state colleges. While we spend a lot of time in our schools focusing on tests that keep our schools and districts accountable, let’s not forget to cheer for our students when they do well on tests that are just for them! Also, students, remember to thank those teachers who helped you along the way – not just the ones at the end. Congratulations to all who helped with these great scores!